Why have authors from the safe, social welfare state Sweden captivated the minds of crime fiction readers across the globe? Kerstin Bergman suggests that killer marketing and a widespread curiosity about the “exotic” Nordic welfare states, their desolate landscapes and alleged gender equality have propelled these authors and novels into the international spotlight. Bergman uses this innovative angle to retell the recent history of crime fiction in Sweden, exploring central themes and selecting key authors that have garnered national and international acclaim for their lethal plots. Swedish Crime Fiction: The Making of Nordic Noir contextualizes the explosive recent history of the genre, offering newcomers and aficionados insights into the minds of protagonist and their literary creators. 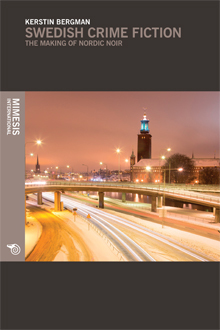 This is the first research-based and exhaustive presentation of Swedish crime fiction and its Nordic “neighbours” to an international audience. Kerstin Bergman is a crime fiction scholar and an Affiliate Associate Professor of Comparative Literature at Lund University, Sweden. She is a member of the Swedish Crime Fiction Academy, and an established crime fiction critic since the mid-1990s. She is the author of the crime fiction textbook Kriminallitteratur: Utveckling, genrer, perspektiv (Crime Fiction: Developments, Genres, Perspectives, 2011, with S. Kärrholm) and of numerous scholarly articles (in English and Swedish) on Swedish and international crime fiction.